PT Sumário: Neste artigo mostro o principais detalhes da jaqueta “Little Black Jacket” inspirada em Chanel e dou enlaces para os artigos mais relevantes, resumo dos materiais usados, recursos de aprendizagem, etc. Creio ser melhor escrever este artigo antes de vos apresentar o meu próximo projeto ;). 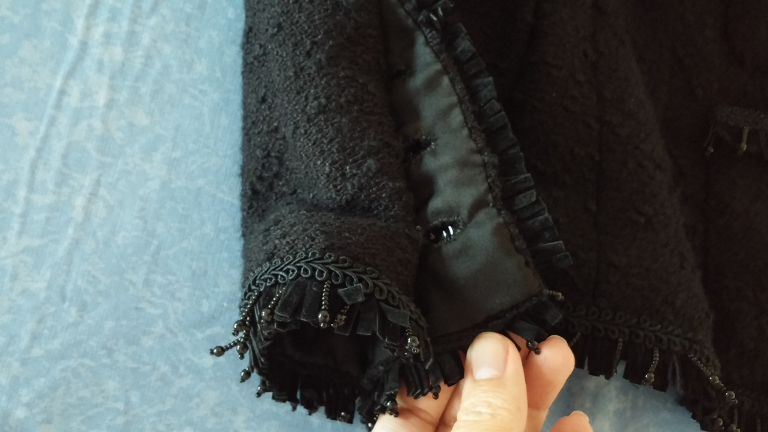 PROJECT DESCRIPTION: I was inspired by the Little Black Jacket vídeo (click here) and decided to make my own couture version of this jacket. My jacket has princess seams originating from the shoulders on both back and front, three-piece “bangle length” sleeves with sleeve vent extension, buttoned front, four patch pockets with handworked buttonholes and buttons, located bellow and just above the waistline and it has a round collarless neckline. 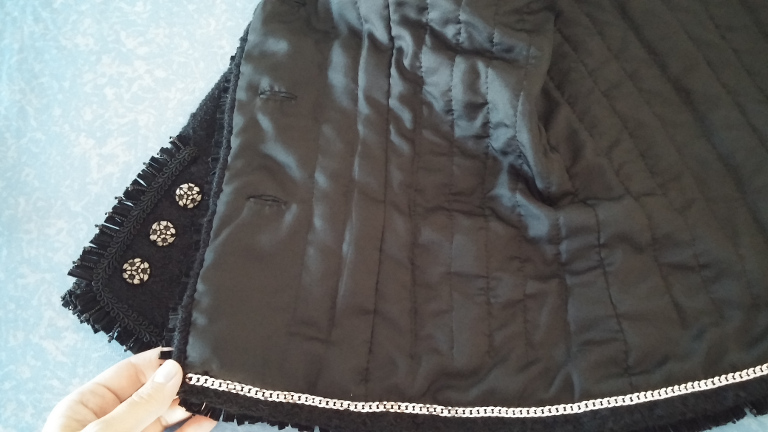 The silk lining is quilted to the fashion fabric, all buttonholes are handworked and the front closure buttonholes have a “faux welt finish” on the wrong side, typical of classical Chanel Haute Couture jackets. Jacket has fringed trim applied by hand on all edges, including pockets and sleeve vent and sleeve hem. Haute Couture methods and materials were used. PATTERN: I used Susan Khalje’s jacket pattern as a base (click here) and customized it accordingly. Click here for the article describing the first pattern alteration and fitting of the muslin. MATERIALS and NOTIONS: extra-wide knit boucle and silk habotai (silk twill quality and weight) both from GORGEOUSFABRICS.COM; CLOVER silk thread size#50; polyester buttonhole twist (didn’t have enough silk buttonhole twist for this project so I used polyester instead); high quality flat silver chain (also available on Susan’s webshop); five crystal/metal engraved buttons plus 10 more smaller buttons (local store); high quality gimp trim with suede/beaded fringe (local store); extra-fine silk organza for reinforcements; SewKeys SSi 1´´ knit stay tape; high quality medium weight muslin (local store) for jacket muslin, Japanese extra-fine needles, glass headed silk pins, glass headed extra fine long pins, Japanese basting thread (several colors), Thread Heaven and Beeswax. Click here and here for photos of some of these special purpose notions. DESCRIÇÃO DO PROJETO: Fui inspirada pelo video “The Little Black Jacket” de Chanel (clicar aqui) e decidi fazer a minha versão Alta-Costura desta jaqueta. 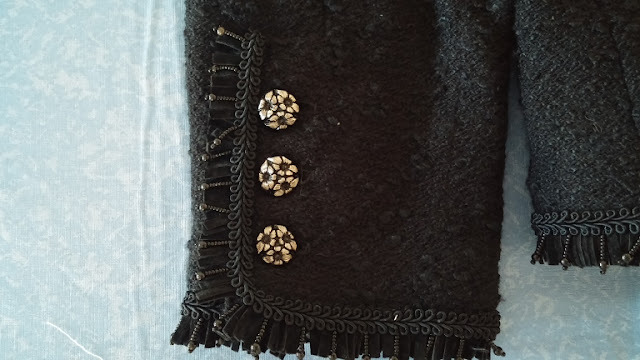 A minha versão tem costuras princesa originadas nos ombros (tanto na frente como nas costas), mangas de três peças de comprimento “pulseira” com abertura e extensão abotoada, fecha com botões na frente, quatro bolsos de chapa (com casas de botão e botões) localizados abaixo da linha da cintura e imediatamente acima desta, e decote redondo sem gola. O forro de seda natural foi acolchoado no tecido exterior, todas as casas de botão são bordadas à mão e as casas ao longo da frente têm um acabamento no interior semelhante às casas avivadas, tal como tipicamente é feito nas jaquetas Alta-Costura clássicas Chanel. Foi aplicado um galão com franja em todas as bordas, incluindo os bolsos e as bainhas/abertura das mangas. Foram usadas técnicas e materiais de Alta-Costura. 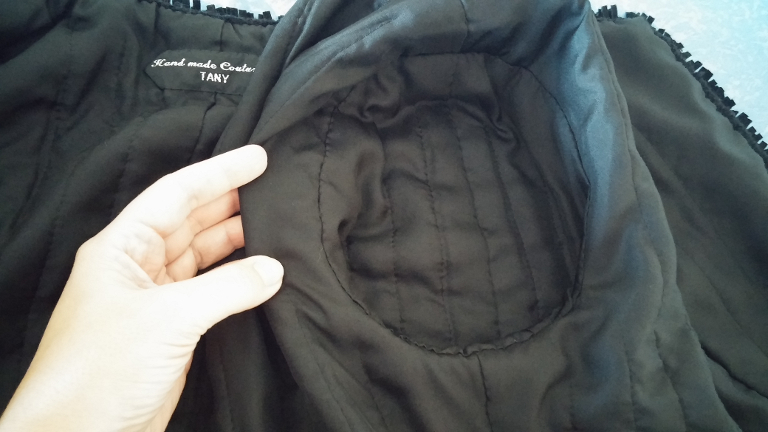 MOLDE: Usei o molde da Susan Khalje como base (clicar aqui) e alterei-o de acordo com a minha visão da jaqueta. Cliquem aqui para o artigo sobre as primeiras alterações e ajustes no modelo de prova. MATERIAIS: Bouclé de malha extra largo e forro de seda natural, ambos de GORGEOUSFABRICS.COM; linhas de seda CLOVER #50; torçal de poliéster para as casas de botão (não tinha torçal de seda suficiente); corrente prateada achatada de alta qualidade (existe à venda em susankhalje.com); cinco botões de cristal com metal gravado, mais 10 botões mais pequenos para as mangas e bolsos (Retrosaria Nova em Aveiro); galão de passamanaria com franja de camurça e contas (Retrosaria Nova em Aveiro); organza de seda extra-fina para reforços; fita de malha termo-colante SewKeys SSi 2,5cm ; pano crú de alta-qualidade (Retrosaria Novo Estilo em Aveiro) para o modelo de prova, agulhas japonesas extra-finas, alfinetes para seda com cabeças de vidro, alfinetes longos com cabeças de vidro, alinhavos Japoneses (várias cores), Thread Heaven (amaciador para as linhas) e cera de abelha para fortificar as linhas. Clicar aqui e aqui para ver fotos de alguns destes materiais especiais. - The finished jacket on me! - A vestir a jaqueta terminada! Thank you all for following along!! / Obrigada a todos por me terem acompanhado! Tany, it is beautiful. Thanks for sharing the process and for doing this post with all the links. I'll be bookmarking this for when I eventually get around to making one of these. Very beautiful and inspiring work. All your efforts paid off. 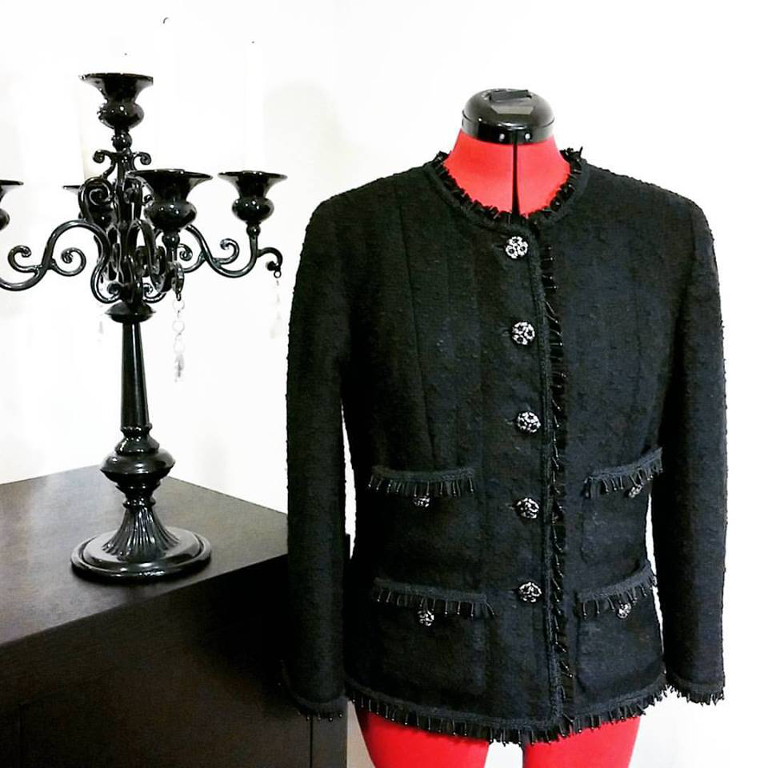 Beautiful, magnificent and also such a tremendous resource for anyone who aspires to make a Chanel inspired jacket. Your attention to detail is so appreciated. Breathtaking! You did a very nice job on this! 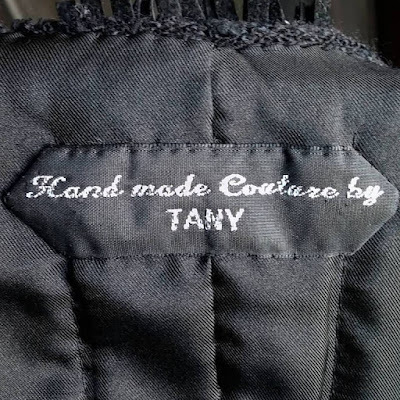 It quite exquisite, Tany. Thanks for sharing your journey and all the details and helpful hints you've provides. 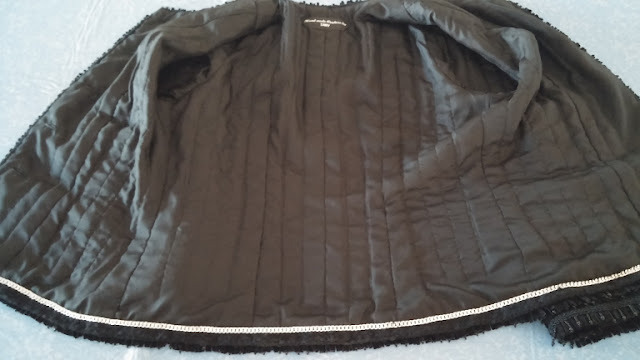 Realmente, um trabalho de mestra, sua jaqueta Chanel ficou maravilhosa. Me encanta ver o seu cuidado com as etapas da confecção e a sua colocação para consulta. 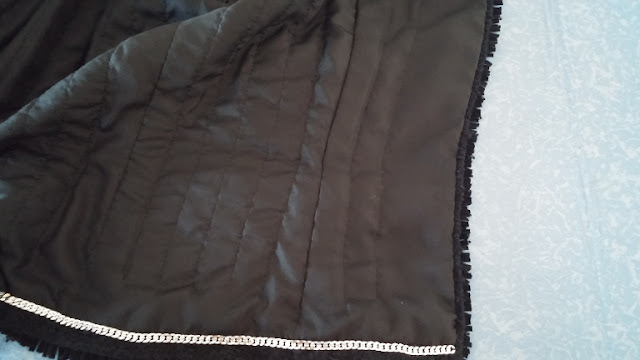 Amo trico, feltro, bordado, mas a costura é a minha paixão maior, e não tenho mais espaço para tanta roupa que faço (mais as que compro prontas), e amo casacos, e neste inverno consegui segurar os dedos e confeccionar somente dois rsrsrs. Gosto de passar em seu blog, é fonte de inspiração e idéias, e não comento mais por falta de tempo. Tenha uma boa semana. Bj. 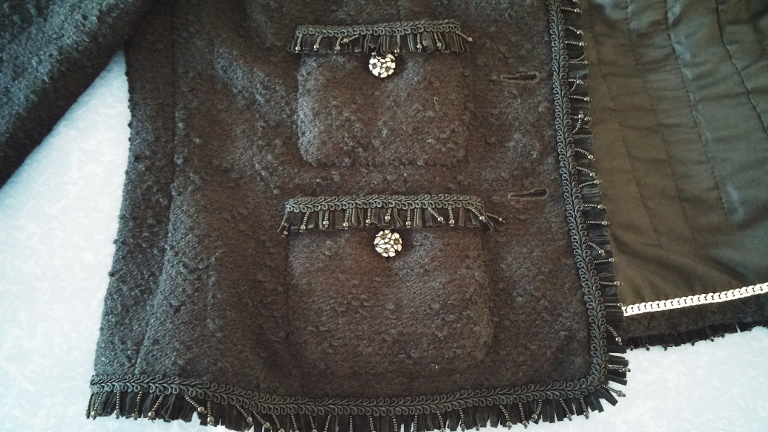 You've just created such a wonderful resource for making these jackets. Beautiful work, Tany, both the jacket and the great post. Your version is just gorgeous and a reflection of the amount of time and care that obviously went into it. I really love how the lining looks on these jackets, I can imagine it feels wonderful to wear, maybe I will find out for myself one day....!